Technology advancements are everywhere we look! From running our days from our mobile phones, to sending instant communication to people across the world! Within the construction industry, one of the biggest advancements in technology has been the rise in framed construction and straying from the typical brick built homes. With an abundant amount of building materials available, construction can now take a fraction of the time it once did! By using a framed construction method, carpenters can assemble and erect frames in days rather than the weeks taken by contractors laying brick after brick. In Australia in particular where weather can be a regular issue in construction, the use of prefabricated frames means production is not implicated even by the heaviest of weather. Framed construction can allow for the perfect balance of heat retention and insulation at all times of the year. Although brick style homes can regularly be known as the common choice across Western Australia, the thermal properties of bricks are known to perform poorly as an insulator across the state. The inherent strength of steel framed construction provides structural integrity to all types of environments and conditions. From our cyclone-prone areas up north, to the cold climate of the regions down south, there is no comparison to the robustness of structural steel frames. 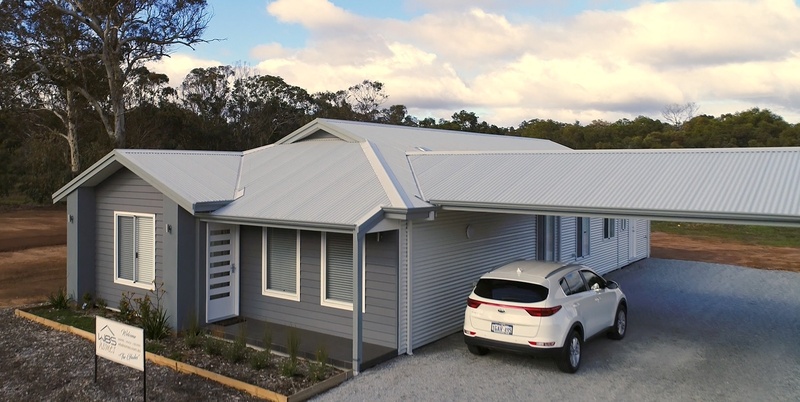 Framed construction can range in appearance from the modern architectural styles we see in the heart of the city; to the traditional weatherboard style homes we see whilst travelling the countryside. From fibre cement boards with stone cladding and timber features to brick veneer and tiled finishes, the design options are almost limitless. With an endless supply of non-structural cladding's, linings and finishes available, framed construction can be used to create a design that truly reflects you! It had previously been thought that brick and framed construction varied significantly in cost. However, when considering the overall prices of homes, the price difference can be very miniscule. The construction style truly comes down to the overall benefits of one material over the other, and your personal preference. We believe framed construction is the smarter, more efficient way to build! If you would like to find out more information on the different styles of construction, download our E-book today!